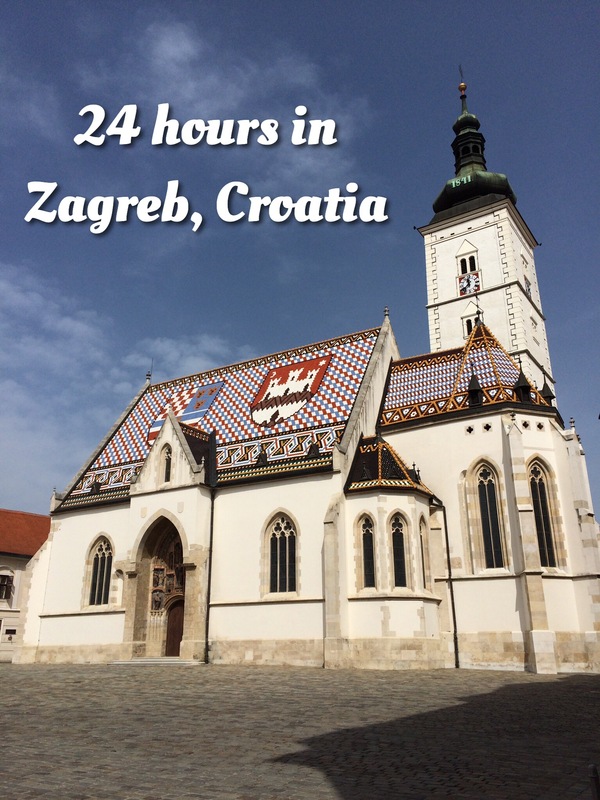 To kick off our two-week trip to Europe, the girls and I started out in Croatia, beginning with just about 24 hours in the capital city of Zagreb! We arrived in the afternoon after an 8-hour flight from Cincinnati to Paris, a 4 hour layover and another 2 hour flight to Zagreb. Exhausted from the long day spent traveling and losing 6 hours with the time change, we checked into our hostel, Swanky Mint. After dropping our bags off in our room (and making a stop at the hostel bar to take our free welcome shot of rakija, a kind of homemade brandy made with herbs), we didn’t want to waste any of our short time in the city so we got dinner around the corner and then headed to the upper town to walk around a bit. We saw St. Mark’s Church with its famous tiled roof and the lesser-known St. Catherine’s Church, with a great view of Kaptol, the lower part of the old town. Then we visited the Museum of Broken Relationships. Yes that’s right, a museum full of mementos from relationships after they ended, from things you’d expect like photo albums and ticket stubs to things like a wedding dress, a toaster and even an ax! It was really interesting reading all of the stories along with the pieces on display, but it was definitely a downer hearing so many stories of failed relationships so we were all ready for a drink after! We stopped at the oldest tavern in Zagreb, Pod Starim Krovovima, which was right around the corner from St. Mark’s Square, before heading back to Swanky Mint for the night. The next morning, after getting ready and eating breakfast at the hostel, we joined a free walking tour – which I highly recommend! (You’ll notice this is a trend of our trip!) On our 2-hour walk, our guide took us back up to St. Mark’s Square where we learned more of the history of the area we had explored the previous evening, and around the rest of the upper town including visiting the cathedral and walking through the Dolac market. Then we got lunch of strukli at a restaurant called LaStruk recommended by our walking tour guide. Strukli is a dish made of dough and cheese that is a traditional food from Croatia; it can be salty or sweet and some also have additional ingredients, such as truffles or honey and walnuts. As our guide put it, a local’s preference will depend on “whether his granny made salty or sweet.” It was absolutely delicious and we spent half the lunch discussing the feasibility of opening up a strukli restaurant once we got home! After lunch we took a walk through the horseshoe of green spaces around Zagreb, all within walking distance of both the upper town area and our hostel – in fact the whole city is very walkable! The horseshoe walk took us through a few beautiful parks as well as past the Art Pavilion and the Croatian National Theater. Towards the end of the afternoon, we found a café where we could sit in the street and people watch – from what we heard, a very typical Croatian thing to do – until it was time for us to head to the airport to catch our flight to Split! There was too much to fit in just one post, so next up is more interesting facts about Zagreb! This entry was posted in Croatia, Europe, Eurotrip 2016-Croatia, Vienna, Budapest and Venice, Zagreb and tagged Croatia, Europe, Schmahl World, travel, travel tips, Zagreb. Bookmark the permalink. Great post! I will be in Zagreb later this summer so I look forward to trying your suggestions! Thanks! Enjoy your time in Zagreb!